Convenient for you, fun for your pet! 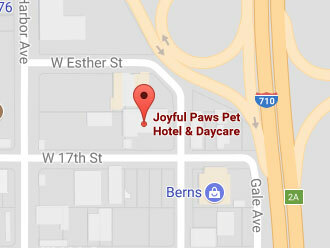 Joyful Paws Hotel is located just off the 710 Freeway at 1701 Fashion Ave in Long Beach. We're convenient to the entire area including Lakewood and San Pedro. Give us a call if you need more info!